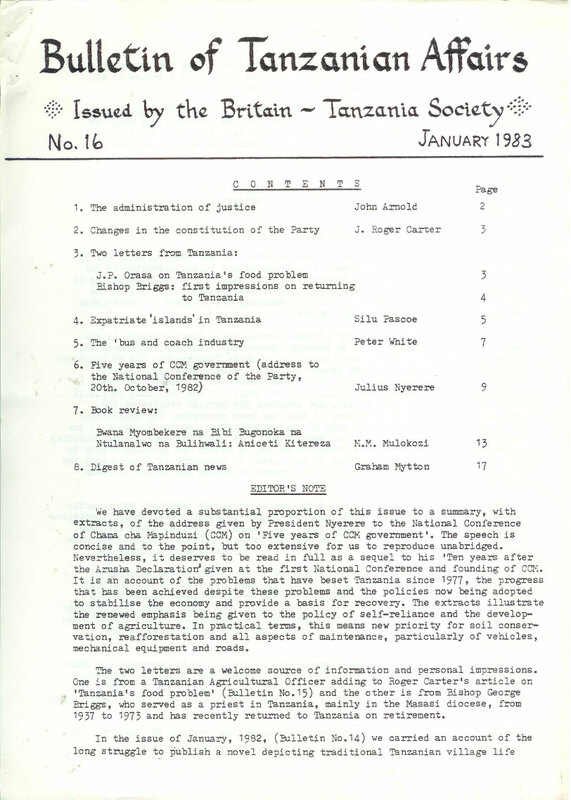 We have devoted a substantial proportion of this issue to a summary, with extracts, of the address given by President Nyerere to the National Conference of Chama cha Mapinduzi (CCM) on ‘Five years of CCM government’. The speech is concise and to the point, but too extensive for us to reproduce unabridged. Nevertheless, it deserves to be read in full as a sequel to his ‘Ten years after the Arusha Declaration’ given at the first National Conference and founding of CCM. It is an account of the problems that have beset Tanzania since 1977, the progress that has been achieved despite these problems and the policies now being adopted to stabilise the economy and provide a basis for recovery. The extracts illustrate the renewed emphasis being given to the policy of self-reliance and the development of agriculture. In practical terms, this means new priority for soil conservation, reafforestation and all aspects of maintenance, particularly of vehicles, mechanical equipment and roads. The two letters are a welcome source of information and personal impressions. One is from a Tanzanian Agricultural Officer adding to Roger Carter’s article on ‘Tanzania’s food problem’ (Bulletin No.15) and the other is from Bishop George Briggs, who served as a priest in Tanzania, mainly in the Masasi diocese, from 1937 to 1973 and has recently returned to Tanzania on retirement. In the issue of January, 1982, (Bulletin No.14) we carried an account of the long struggle to publish a novel depicting traditional Tanzanian village life written by Aniceti Kitereza. This book is now available from the Tanzanian Publishing House and we are very pleased to be able to print a review of it by Mr. Mulokozi of the Institute of Kiswahili Research. At the time of writing there has been no report of a conclusion to the negotiations between the Tanzanian Government and the International Monetary Fund for financial support to enable Tanzania to deal with the crisis in its economy. It appears that negotiations are continuing and we hope to have a report for the July issue. 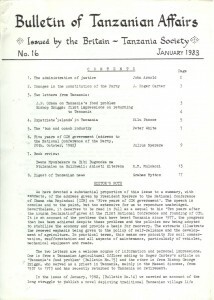 The need for revision of the Preventive Detention Act (see Bulletin No.15) was raised by Members of Parliament during the debate on the estimates of the Ministry of Justice during the budget session in July, 1982. The questioning of the operation of this law follows a Faculty of Law Symposium reported in the Bulletin. The Minister, The Hon. Julie C. Manning, MP, promised to investigate the possibility of reconsidering the law. A recent broadcast in the BBC African Service and a similar report in the Guardian based on interviews with lawyers, government officials, diplomats and former detainees by Martha Honey claimed that, while Tanzania has had no political prisoners since about 1978, the detention law is being widely used against economic saboteurs and other criminals. Those suspected of crimes who cannot be prosecuted, either because of insufficient evidence, or the fear that they will bribe their way out of conviction, are detained for periods similar to the sentences they would have received if they had been convicted. The report also claims that this system, which aims to bypass corruption and inefficiency in the legal system, has produced its own rackets and that government officials, including ministers, have sometimes been demanding bribes in return for granting visits by families and obtaining the release of detainees. On occasions it is said that the President’s orders have been delayed or ignored by prison and police officers seeking bribes. There are no official figures of the number of people detained, but recently released detainees have estimated that the figure is about 1,500. Prison conditions are over-crowded, but ex-detainees admit that cases of physical abuse are rare. In addition, there are thought to be several thousand habitual violent criminals detained under comparatively mild conditions in remote farming settlements. Members of Parliament were concerned about the levels of the salaries of magistrates and judges, which were so low that many were leaving the judicial service. The shortage of magistrates is adding to the problems caused by the inefficient and at times corrupt administration of the lower courts. The Minister is pledged to fight bribery and has asked for the cooperation of all in reporting cases, promising to continue her policy of dismissing anyone known to have accepted a bribe. Tanzania has now signed the Organisation of African Unity Convention on Human and People’s Rights, which prohibits arbitrary arrest and detention. Tanzania is the twelfth state to sign the convention. When a majority of the 26 members have signed, the OAU will be empowered to establish a commission to protect human rights in Africa. As before, these officers are to be elected for a term of five years by the National Conference, but henceforth election is to be by secret ballot. The National Executive Committee is now empowered to suspend either officer if his conduct or activities contravene the requirements of good leadership, subject to reference to the National Conference for a final decision. This body, charged with day-to-day administration under the National Executive Committee, has been reduced to 15 members of the NEC in addition to the officers from 30 members appointed by the NEC plus up to 10 further members nominated by the Party Chairman. Thus, the Chairman’s right of nomination is abolished, as is also a special subcommittee of the Central Committee responsible for guiding and supervising the activities of the Government with respect to Zanzibar. The Committee is to increase the frequency of its ordinary meetings from two monthly to monthly. In contrast to the Central Committee, the size of the NEC is increased from a maximum of 142 to a maximum of 193, with an additional emphasis on Regional membership and the Party Secretary is now a member in his own right. The functions of the NEC are more clearly defined than before and now include the duty of proposing a candidate each for election as Chairman and Vice-Chairman of the Party and as President of the United Republic and of making the final choice of a candidate for election as Head of Government in Zanzibar. The National Conference will continue to be called in ordinary session every five years, but the NEC will ordinarily meet every four months instead of six and the corresponding Regional and District organs are also to meet more frequently. The changes in general seem to be aimed at strengthening the Party as a machine for guiding the objectives of government and for mobilising and educating popular support. There is, however, as before no direct link between members at the grass roots and either the National Conference, or the NEC. The National Conference has about a thousand members, of whom one third are members of the Bunge (parliament of the United Republic) and of these a third are constituency elected members. Thus only about a tenth of the membership of the National Conference are responsible to the electorate not limited to Party members. The influence of the grass roots member is felt mainly at branch, Regional and District level. All branch chairmen and a member elected by each branch have places at the Regional Conference of the Party, while the District Conference includes the chairman and three members of each branch. I am writing to comment on Mr. Roger Carter’s article on ‘Tanzania’s food problem’, which appeared in the Bulletin of Tanzanian Affairs No.15 of July, 1982. Throughout the twenty one years of Tanzania’s independence the question of food has consistently received top priority, but the results of various programmes and planning exercises have had no meaningful results, as the food situation has not been steadily improving. It is, however, fortunate that the situation has not gone out of Government control, although the import bill is scaring. Mr. Carter has rightly pointed out that the causes of Tanzania’s failure to feed itself are complex. In addition to the problems enumerated by him, the demand for food is exaggerated by certain food-eating habits. As it may have been noted, the food problem in Tanzania is based on the supply and consumption of maize, rice and wheat. These are the most preferred cereals that form the main staple grains. Maize is the most consumed; the per capita maize consumption between 1975 and 1977 was 82.9kg, or 63.8% of all cereals consumed including sorghum and millet. The majority of Tanzanians still cling to maize meal because it can easily be accommodated within the household financial limits. An indigenous coastal dweller does not willingly part with his rice meal, just as a Southern Highlander would not like to miss his maize meal. As a consequence of these dominant and sometimes inflexible food habits certain food crises or shortages are more apparent than real. These food habits indirectly control the tastes and palatability of food. It is probably because of these habits that the sorghum and millet preparations are not as popular as those of maize, rice and wheat. By using better shelling methods and if more research into possible preparations of delicious sorghum dishes is carried out, this dry-weather resistant crop will save the nation from frequent spells of food grain hardships. The move away from millet, sorghum and cassava over the years into maize, rice and wheat has increased the burden on the producers of these cereals, who have been unable to cope with consumer demand. Up until now there are villagers in many of the rural areas who are not aware of the food problem facing the country. In their small plots scattered here and there they produce bananas, sweet potatoes, yams, majimbi (a kind of root spinach), round potatoes, cassava, etc. in addition to cereal crops. These people have sufficient food throughout the year. But as the same people move to urban areas they tend to shy away from these traditional food items, thereby increasing the demand for cereal crops. If these indigenous foodstuffs were preserved and distributed to areas facing food shortages, the growers would be encouraged to produce more and the demand for cereals would decrease. Another problem that aggravates the food situation is the lack of adequate storage and transport facilities. As a result the food piling up in one Region cannot be moved to areas requiring it in time. For example, the surplus maize in Ruvuma and Rukwa Regions in 1980-81 could not be fully utilised before it got spoiled. This year about 55,300 tonnes of round or Irish potatoes in Iringa Region failed to get to market in time due to transport problems. Thus, the food problem of Tanzania does not arise simply because the country cannot produce enough to feed her people. Much of the surplus food is spoiled for lack of proper storage and because of an unsatisfactory distribution system. A substantial amount of local produce, including fruits and vegetables, cannot find markets. If this problem could be solved, there might even be a surplus of some products for export. One of the first impressions of someone who is returning to Tanzania after several years’ absence is the startling increase in the size of the population. When I first knew Mtwara during the war years it was a small fishing village and now it has a population (together with Mikindani) of 60,000. Its new start in life occurred shortly after the war as a result of one of the British Government’s less successful initiatives – the ill-fated Goundnut Scheme. Mtwara was the railhead where the nuts would arrive from up-country and the port from which they would be despatched to their destinations. Well, the project came to nothing, but Mtwara has since grown to become a Regional headquarters. I learned only yesterday that four or five cashew nut processing factories have been built at great expense in this area, where cashew trees are abundant, but that they are all standing idle. Why? Because the market for these nuts is mostly in America, where they offer a small price for the processed nut and a much larger one than Tanzania can afford to ignore for the whole nut. The point is that this nut has several valuable properties apart from its kernel- properties which Tanzanians were hoping to exploit through their factories. But now …! Is it surprising that Nyerere is mad with the Western world? As if USA could not afford to forego its profits on the processing of cashew nuts and leave them to a developing country which needs them very badly. If Sunday attendance at church is anything to go by, then the Christian religion is in good heart in Tanzania. Recently I have had opportunities to attend churches other than the one here, two in Dar es Salaam and two up-country, and the congregations were all impressive, as indeed they are here at Mtwara. Self-support in terms of cash is improving too. The factor which for some of us is a worry is the almost total absence of voluntary service, either for the church, or for anything else. This is an essential element, surely, in the Christian religion; without it a parish, a diocese, or other ecclesiastical unit is defective. This apparent absence of a spirit of self-giving comes out, I think, in the fact that very few of our ordinands have had more than a primary education. The minimal response to vocations- presuming they are there!- from people with a good academic record is very disturbing. As in many poor societies, theft, bribery and corruption are rife in Tanzania. I mention this, as I have suffered from it twice during the short time I have been in this country. On the first occasion I was relieved of all my money as I was boarding a bus for Korogwe in Dar es Salaam. Fortunately, I discovered what had happened before the vehicle started and so was saved from what would have been an embarrassing situation. The second time was at 4 p.m. on a Saturday, when most of us on the compound were in church at evensong; the housebreakers had a rare field day when they got into my bedroom and found the contents of four suitcases lying about. I was in the middle of unpacking them. I regret most the loss of a cassock (alb) made for me by a Carmelite nun in Mauritius, which I had not worn. There is no benefit provided by the state here for unemployed school leavers and they, together with soldiers returned from Uganda, are said to make up a large proportion of the culprits. Tanzania’s political leadership believes that a system of private enterprise is incompatible with the country’s desire for genuine political independence and social equality. It wishes to avoid dependence on private foreign investors and multinational corporations, which would entail an increase in foreign political and economic influence. Although the total impact of post-Arusha nationalisation on the structure of commerce and industry is considerable, a large private sector remains in Tanzania. The very visible private or foreign financed enterprises which we saw in Tanzania during the Southampton University Study Tour of August, 1981, generated conflicting feelings within the tour group just as they must do within Tanzania itself. Were Peramiho Mission, Sao Hill Sawmill and the Brook Bond Tea Company to be viewed as laudable islands of excellence, or neo-colonial paternalistic enclaves? Peramiho Mission was founded in 1898. Its present operations cover health education and industry in addition to religious work. The printing department is self-sufficient except in inks and certain other items, which are imported about every four months through Mtwara. The Government relies on it to print examination papers and official forms. The printing workers usually stay, while those in the garage and carpentry workshop tend to move away and establish their own businesses after training. The trade school also has tailoring and shoemaking sections. Despite the policy of africanisation at Peramiho, one felt that the German brothers saw it as their responsibility to maintain a presence. There were 25 European brothers with an average age of 60. The mission hospital also had expatriate doctors and Tanzanian doctors generally speaking were reluctant to work there, partly because they preferred a normal urban community and partly because of a half-acknowledged feeling of distaste for the atmosphere of a mission and the relationships that prevailed there. Drugs for the hospital were obtained direct from 1urope and America, financed by charitable organisations. An African priest trained at Peramiho observed that although the mission had done good work it was too introverted. A Tanzanian official who had been born in the area pinpointed the ambivalent attitude towards Peramiho when he remarked that if the German priests left the ‘Peramiho system’ would change very quickly, as Tanzania would not be able to obtain the materials to maintain it. The Tanzanian Government had, indirectly, asked the Germans to leave, but they bad not yet done so. Sao Hill Sawmill in Mufindi was the first example of moderately large scale industry which we visited during the tour. The sawmill was run by a company funded by the Norwegian Agency for International Development (NORAD) and production started in 1975. It is the biggest project of its kind in Tanzania. Originally there had been 11 expatriate workers, now there are 5, including, significantly, the project manager and a mechanic. The area did not have a high population density. There were 360 workers, mostly living in local villages, but a growing number occupied houses built on the site. The sawmill helped local villages by buying food and providing employment. However, there were problems of marketing as opposed to producing ire timber and much was being stockpiled. Some of it was exported, but more could have been sold within the country if potential buyers could have provided their own transport to collect it. This marketing problem was threatening the firm’s profitability. The comments of the Norwegian project manager highlighted some of the difficulties of such a foreign-financed project. Originally, the Norwegians were to have been at the sawmill for five years, but this period was being extended. He felt that it would take 10 to 20 years for full africanisation. He was worried about the future of the project because of doubts about the maintenance of discipline and productivity, which Tanzanians fresh from training found hard to enforce. The economic organisation and structure of large-scale industry were still strange and new to his Tanzanian colleagues. The Brook Bond Tea Company at Kilima, also in Mufindi District, had 9 expatriates, amongst them engineers, accountants, a doctor and two estate managers. Tanzania has not nationalised its tea estates, except those formerly owned by Lonrho, and the Brook Bond Company was accepted by the Tanzanian Government because it was earning foreign exchange, tea being one of the few export crops until recently growing in volume. The situation has now changed with tea being overproduced and costs, especially fuel, increasing, making tea production hardly profitable. However, the company still made money on its marketing side. Tea production is labour intensive, but seasonal and insecure. The development of villages over a wide area is inhibited by the removal of manpower during the growing season. The pace of africanisation of the management seemed slow. An African junior manager, who had moved to Brook Bond from a Government post because the salary was better commented on the difficulties involved in full africanisation. In his experience, expatriate managers had more success than Tanzanians in obtaining licences to import machinery and materials. Such foreign companies can contribute to a form of economic growth, but whether it can become the basis for long term development is more debatable. Do such investments really lay the foundation for indigenous growth when the capital, technology and expertise must be matched ~ an equally expensive infrastructure of roads and vehicles? There may well be increasingly effective competition from peasant producers using family labour and the minimum of equipment. The debate helped to occupy the time on the long journeys over bumpy Tanzanian roads. We were divided over the theoretical advantages of foreign investment and management, but we were all intensely grateful for the warm welcome, the hospitality and the way in which busy and sometimes worried people were willing to show us round and answer our endless questions. Chairman’s address to the National Conference of Chama cha Mapinduzi given on 20th. October, 1982, in Dar es Salaam. As the full address occupies 66 pages, the following is a summary-of the main points contained in it. The address begins with a brief survey of Tanzania’s foreign policy and reaffirms commitment m the liberation struggle in southern Africa, support for the Organisation of African Unity, active participation in the Non-Aligned Movement, the United Nations, the Commonwealth and special meetings such as that at Cancun, regional organisations such as the Southern Africa Development Coordination Conference and the Kagera Basin Organisation, and the building of friendship with all countries on a basis of mutual respect. On 5th. February, 1977, he reported to the Party on the national economic and social situation ten years after the Arusha Declaration and warned that despite the progress that had been made the next three or four years would be very difficult. That has certainly been the case. World recession has created economic difficulties for developed and developing countries alike and this is the world environment in which Tanzania has to live and do business. Tanzania has been very seriously and very adversely affected. In addition, Tanzania has had to repel and destroy an aggressor. Tanzania now faces formidable economic problems and declining living standards and it is on this front that it now has to fight back, correcting past mistakes, overcoming weaknesses and keeping clearly in view its basic goals. The prices of imports have increased much faster than those of exports. Despite the growth of population, in 1981 oil imports were only 70% of the 1972 figure, but the oil bill in foreign exchange increased more than sevenfold. In contrast, the price of coffee fell over 5 years by 40%, tea by 29% and tobacco by 12%. The prices of cotton and sisal have risen, but this has been offset by falls in production. The breakup of the East African Community cost Tanzania the loss of many vital maintenance, training and communications facilities and required expensive investment to create an airline, civil aviation support services, railway repair workshops, central postal services and an earth satellite, nearly all of which had to be paid for in foreign exchange. The war in Uganda in which 684 soldiers were killed and 467 seriously injured cost over shs. 4,000 million, a large part in foreign exchange. Finally, there have been problems with the weather, a succession of bad harvests, droughts, floods, damage to roads, bridges and crops. These external problems have been the main cause of our difficulties. But problems have also been caused by our own successes. First, as a result of rising expectations people now expect to be ace to drink tea with sugar, wash with soap, light their houses with paraffin lamps, buy new clothes sometimes, obtain cement and corrugated iron for their houses and secure medical help when they are ill. These are things that the people did not expect 20 years ago. Primary education has expanded from half a million children in school in 1961 to three and a half million in 1982. The establishment of industries and the expansion of road transport have created a need for imported fuels, spare parts and chemicals. Investment in social services has greatly reduced the infant mortality rate and as a result the population has doubled in 20 years. But we have also suffered from our own mistakes and failures. My appeal in 1977 to improve industrial discipline, reduce costs and increase efficiency in both parastatals and Government has had little effect. Payrolls, particularly at senior level, have been maintained even when production is much reduced. Since 1977 employment in Government ministries has increased by 35%. Policy making has been done with great seriousness, but decisions are not always carried out and financial regulations are often ignored with impunity. Our most fundamental failure is perhaps our neglect of the principles of self-reliance. Traditional skills in carpentry and metal working have not been used to make good shortages of imported tools and equipment and in this there has been little improvement in detail, and none in attitude, since 1977. However, “things have changed for the better Virtually everywhere, so that village life is now very different from life in the isolated homesteads we knew a decade ago. Almost all villages now have a primary school; 90% of them have at least one cooperative shop; about 31% of the villages (and about 40% of the village people) now have easy access to a safe water supply; and well over 30% of the villages have either a dispensary, or a health centre, with others being served by regular clinics. In the health services emphasis is being laid on preventive work, which does not require expensive training or drugs. Already 10.6% of the recurrent budget is spent on education. Adult education is now making an important contribution despite shortages of materials and Universal Primary Education (UPE) has made great advances, though much remains to be done in improving its quality and integrating the school into village life. Unfortunately, the post-primary technical centres, so important for supplying the villages with skilled craftsmen, do not seem to have attracted much interest or support. The Government will continue to emphasise the importance of technical and vocational training so vital to our development. Although the proportion of primary school graduates who go on to a secondary school has now fallen to 2•6% as a result of UPE, we cannot at present afford more secondary school places and will concentrate for the time being on consolidating what already exists. At the University the proportion of women students has now increased to 23.8%. There are still not enough qualified students coming forward from our secondary schools to fill all the available places in science-based subjects and we are trying to rectify this by earmarking 60% of the science graduates for training as teachers in our secondary schools. But university education is enormously expensive- on an average about shs.70,000 per student- and the University authorities are now looking into the means for reducing this very heavy cost. The Dar es Salaam bus service has less than half the buses it needs to provide a good service and less than half of these are actually in service. Low fares, which have not increased since 1974, contribute to the low level of service. The joint Tanzania Chinese Shipping Line is operating successfully despite unfavourable world conditions, but the Tanzania Coastal Shipping Line continues to have severe problems despite valuable support from Norway. The railways have also been operating under severe difficulties, but with the help of Canada and other countries steps are being taken to reverse the decline. The railway system is crucial for the movement of agricultural exports to the ports and food from surplus to deficit areas. The two extensive natural gas fields at Songo Songo and Kimbiji will take 5 to 10 years and much capital to develop, but agreement has been reached for the manufacture of ammonia and urea out of the gas at Songo Songo and negotiations are proceeding on the financing of the large investment involved. In internal trade, pan-territorial pricing is being revised to allow Regional Trading Companies to add the cost of transport to the price of heavy goods. The number of goods subject to price control is being reduced to the most essential as an aid to proper enforcement. In terms of factories built, industry can offer a success story. Some 43 new big projects have been completed since 1977 and another 28 are in an advanced stage of building. But industry has been heavily import-dependent in terms of raw materials, machinery, fuel and, in some cases, management. Starved of foreign exchange for the past two years, industrial production has fallen from over shs. 1,000 million in 1979 to shs.648 million in 1981 and average factory utilisation is now between 30% and 50%, which means high production costs. Small scale industry expanding under the auspices of SIDO has a much better productivity record. It has also been more resistant to economic crisis. Some large factories will have to be closed as a short term measure to allow others to receive enough of their imported requirements to enable them to operate profitably and efficiently. The increasing use of high productivity seeds for cotton, maize, millet, sunflower and many other crops is a ground for hope, but their reproduction in sufficient quantity takes time. Another good sign is the expansion of improved beef and dairy herds and the improvement in beef sales. But the fact remains that the explanations so far offered for our declining production do not appear to go to the heart of the problem. Some say that it is the result of our socialist agricultural policies, but the amount of socialist agriculture that exists so far is very small. For the most part agricultural production comes from individual peasant farms. There are indeed some communal village shambas and some are productive, but their total contribution to village output is slight. It is because those villages with large communal farms are so successful that a rapid extension of them has been urged in the 1981 Party Guidelines. It is also not possible to pin the blame solely on the crop authorities and other agricultural parastatals, though they do have many serious faults. Administrative costs are much too high, there are delays in supplying fertilisers, insecticides and other inputs, crops are not always collected promptly and payment to farmers is often seriously delayed. Steps are in train to remedy these faults, but the problems of agriculture are more deep-seated. One fundamental reason for our shortcomings is that, in spite of professions to the contrary in the Arusha Declaration, in ‘Siasa ni Kilimo’ and other statements, agriculture is not central to our planning and our thinking. Another lies in our neglect of the soil and the need to maintain soil fertility by the use of compost, manure, fertilisers and appropriate crop rotations. Further, we have failed to provide better implements, even enough hoes, and the ploughs and other implements suitable for use with ox traction are commonly not available. Very little use is made of our many rivers and lakes for small scale irrigation. In large areas of Tanzania land is being turned to desert by over-grazing and the careless removal of trees. It is gratifying to note that village fuel woodlots are now being grown in some villages and that 12,000 hectares of trees were planted last year. But a more widespread practice of contour ridging, as already practised by the peasants in Mbinga District, is essential if we are to protect our soil from total destruction. It is our land that is at stake. First, we must remedy those things that are within our power to remedy. Then, although we do not like their prevailing ideology, we must do all we can to reach agreement with the International Monetary Fund (IMF). But the IMF alone cannot solve our problems. Neither the IMF, nor the World Bank, nor anyone else will provide us with all we need for our rehabilitation. Only we ourselves can stop our economic decline on a basis of self-reliance. There is no other choice. “The Structural Adjustment Programme (SAP) is a programme of consolidation, not of expansion. Hardly any new projects will be undertaken. That includes especially new projects in the social services, which in the short term are consumers of wealth and not producers of it. We know that new schools, new dispensaries, new social welfare arrangements, etc., are urgently needed. But we have been forced to recognise that what we do not produce we cannot consume. It is going to be extremely difficult, and require all our combined efforts, to maintain our present health and education services. We shall not be able to expand these services in the coming few years …. The political difficulties of such a programme for every minister and every member of parliament are acknowledged. But there is no alternative. Of great importance are better incentive systems and better economic management, planning and control. For the management of SAP a special implementation secretariat has been set up in the Ministry of Economic Affairs and Development Planning. But in the end the success of SAP depends on all Tanzania’s citizens. The maxim ‘kila mtu afanye kazi’ must be made a reality. Almost every country in the world is facing problems. But those that succeed in overcoming them will be those with good policies and good programmes and the determination to implement them whatever the difficulties in a spirit of self-reliance. The British bus operators the predominant problem today is lack of demand. In Tanzania, despite substantial economic problems, operators face no shortage of customers, but fuel, tyres and spares often constrain the level of service that can be offered. With a population of about 19 million, Tanzania has an area much larger than that of Britain, giving an average density of only 20 persons per square kilometre, as compared with 230 in Britain. Apart from the main port, Dar es Salaam, with a population approaching a million, no town exceeds about 110,000 in population and the rural areas, especially in the centre, are of very low density indeed. Intense local demand is thus found in only a few areas, but long distance travel has grown rapidly as a result of migration and the growth of education. Car ownership is very low – about one car per 300 people – and has a negligible effect on public transport in most areas. Walking and cycling probably account for most journeys, but cannot of course cater for longer distances. Internal air services offer a limited frequency, but in a country where the basic minimum wage is only about £45 per month are used by few. The rail network is limited and suffers from operational problems. The Chinese-built ‘Tazara’ line linking Dar es Salaam with Zambia carries only freight traffic at present*, despite a palatial passenger terminal at Dar es Salaam. The older metre-gauge network, inaugurated under German colonial rule, also concentrates on freight, with one passenger train per day on the route westward through Dodoma to Kigoma and on the line northward to Moshi and Arusha. Between Arusha, Moshi and Dar es Salaam about twenty bus journeys per day operate, vastly exceeding the rail passenger capacity. High demand for bus and coach services is immediately evident from the high loads. One operator bases his budgeting on a minimum load factor of 70%. Pre-booking is desirable, or even necessary, to gain a seat on long distance, routes. Even on a Sunday afternoon, urban routes carry substantial standee loads. In meeting this demand operators face many problems of supply. Fuel accounts for 20 to 25% of operating costs in contrast to 5 to 10% in Britain. Imports of fuel now cost over half the foreign exchange earnings of the nation and physical continuity of supply is also uncertain. Following a critical period in May-June, 1981, many long distance services from Dar es Salaam now carry sufficient fuel for the round trip rather than relying on inland supplies. Tanks to accommodate an extra 440 litres have been fitted to vehicles of the state owned National Bus Service (NBS), while independents carry additional oil drums. The price of fuel varies markedly with distance from coastal ports, reflecting transport costs. For example, at the southern port of Mtwara derv costs about shs.4 per litre (c. 25p. ), but in Songea, 600 miles westward, about shs.6 (c. 40p.). Supply problems also occur from time to time in tyres, although these are manufactured locally following the establishment of a joint operation some years ago with an American company. Poor roads aggravate tyre wear and also cause spring damage. Fairly large stocks of spares have to be held to ensure reliable operation. In view of the limited investment that a country such as Tanzania can afford, it is not practicable to provide tarmac surfacing over a high proportion of the network. Within towns, major roads are surfaced together with some inter-urban links. Most of the inter-urban mileage, however, is unsurfaced. This becomes very dusty in the dry season and muddy in the wet season. Continuity of service on most routes relies heavily on the skill and efforts of driving and maintenance staff. For such conditions a robust type of vehicle is required. Most recent deliveries to both independents and the NBS have been of the Leyland CD23, still carrying the Albion Clydesdale badge. The high floor level and front engine are well suited to the road surfaces and temperatures encountered. Bodywork is by domestic builders, mostly based in Dar es Salaam, including Singh Bros. and the Quality Garage. A centre entrance layout is generally favoured with five across seating to give a seating capacity of about 65 and a well-used roof rack. For urban use a standee layout with rear entrance and front exit and a seated conductor is found. Except in mini- and midi-buses there is no one-man operation in view of the low labour costs and high loadings. The CD23 appears to be well regarded by operators. Accompanied by widespread use of Land Rovers, especially in the South, the Tanzanian scene can present a remarkably high proportion of Leylands on the road, although Scania and Isuzu have caught much of the lorry market. There is one feature which may require some improvement, namely, the hanger bracket securing the front springs, which is liable to considerable punishment on rough roads. A small number of Scania 111’s may also be seen, mainly as works buses, and NBS also has on test a Mercedes 1617. There are two main publicly owned operators, both of which derive from the nationalisation of Dar es Salaam Motor Transport (DMT) in 1970. The long distance services from Dar es Salaam were transferred to the National Bus Service, better known by its Swahili fleetname KAMATA. This company now runs a fleet of about 90 vehicles on both long distance and suburban services. In some cases older long distance vehicles are rebuilt to dual doorway layout for suburban work. An interesting innovation recently has been the introduction of an internal radio network linking head office in Dar es Salaam with inland offices, reducing reliance on the heavily used telephone system. The urban services of DMT were transferred to Usafiri Dar es Salaam, known as UDA, which today operates about 250 vehicles. Leyland and Mercedes high floor single deckers form a substantial proportion of the fleet, but an increasing element comprises the Ikarus units. The first batches of rear engined 266 model have a low rear clearance and the very first a somewhat incongruous appearance, being built to the East-European rule of the road rather than the British, which Tanzania retains, passengers thus boarding on the offside! More successful have been the 280 model articulated single deckers, whose high capacity has proved very valuable in handling growing traffic. Reliability is good, despite the complexity of articulation. Another significant part of the UDA fleet is the Isuzu minibus, operated on selected routes at a premium fare. No private competition is permitted in Dar es Salaam apart from the numerous unmetered taxis. Shared taxis, or other forms of ‘paratransit’ found in developing country cities, are generally absent. Elsewhere in Tanzania a very different picture is presented with independent operators carrying most of the traffic both on routes competing with NBS and on routes not otherwise served. There is no price competition, all prices being regulated to a common scale, but there is competition in service quality and availability. A particularly marked concentration is found on the Dar es Salaam-Moshi-Arusha road, with about 15 to 20 operators, most with just one or two buses on the route. The standard Dar es Salaam-Moshi fare (in 1981) is shs.90, but at least one operator offers a ‘luxury’ service at shs.130. Another publicly owned operator is the Tanzania Railways Corporation (TRC), who in addition to railways as such run extensive road fleets originating as rail feeder services in the days when long distance road transport was less common than today. The former brown and cream colours of East African Railways, from which TRC split off in 1976, are retained. The principal operating base is Iringa, some distance south of the main east-west line. In southern Tanzania considerable problems were caused by the collapse of “Teeteeco’, a publicly owned operator, which suffered severe maintenance problems providing freight and passenger services. Its operations have been taken over by three smaller companies under the control of the National Transport Corporation based at Lindi, Mtwara and Songea known as KAULI, KAUMU and KAURU, which is mainly running buses at present. New Leyland CD’s have been supplied with assistance from World Bank funds under a ‘rehabilitation and improvement’ project. Overall it is clear that considerable scope for expansion exists in Tanzania provided that problems of fuel supply, maintenance and road surfacing can be successfully overcome. * in 1981; now there are believed to be one passenger train in each direction per week. Bwana Myombekere na Bibi Bugonoka na Ntulanalwo na Bulihwali: by Aniceti Kitereza: (completed on 13th. February, 1945): pp.617: Tanzania Publishing House, Dar es Salaam, 1980: hard cover shs.115, paper back in two volumes, shs.35 each. When Mzee Aniceti Kitereza died on 20th. April, 1981, at the age of 85, few people in Tanzania and fewer still outside Tanzania had ever heard of him. The local media did not even mention the incident. He had lived and died an ordinary man. On the surface his life had been no different from that of hundreds of other German educated contemporaries. He had been a teacher, catechist, petty trader, building clerk, cooperative officer and finally, in his old age, peasant. Yet this apparent ‘ordinariness’ was deceptive. The practical matter-of-fact worker was also the passionate thinker, educator, philosopher and scholar. He was a walking encyclopaedia of the ways and customs of the Bakerebe and, above all, a lively, unique, confident and highly talented novelist. Kitereza probably hardly realised what an inestimable ‘offspring’ he has bequeathed mankind in the form of his 618 page, two volume novel, Bwana Myombekere na Bibi Bugonoka na Ntulanalwo na Bulihwali (henceforth Bwana Myombekere na Bibi Bugonoka…). In his long life, Kitereza had more than his rightful share of life’s tragedies. In many ways the tragic streak in his life is paralleled in the lives of his major characters, Bwana Myombekere and his wife Bibi Bugonoka. They, like Kitereza, are obsessed by a desire for offspring. It is true that they do get two children. But the first child is prematurely stillborn and the second child, also born prematurely, lives for only one day. Thereafter Bugonoka has no more pregnancies and as a result becomes increasingly despised and alienated from her husband’s relatives. Only Myombekere loves and tolerates her, all the while struggling to find a cure for her ‘barrenness’. Matters reach a head when Bugonoka’s parents, Namwero and his wife Nkwanzi, hearing of their daughter’s maltreatment, decide to take her back, leaving Myombekere without a wife. Thus to the shame of barrenness (for a shame it is in this pre-colonial Kerebe society) is added that of bachelorhood and the accompanying loneliness and distress. Myombekere has to decide whether to marry another woman, or to bring back Bugonoka. His half-hearted attempts to woo another woman prove futile. He ends up prostrating again before the father-in-law, begging for forgiveness and the return of his wife. Thus begins the story of the adventures of this unhappy Kerebe family that is supposed to have lived sometime in the seventeenth or eighteenth century. It revolves around the twin poles of production and reproduction, creation and procreation. Through production, within the framework of his clan, his village, his kingdom and the accompanying traditions, beliefs, customs and taboos, Kerebe man produces wealth in order to build his eka (or Kaya, or household) and hence realise his humanity and his manhood. This he can achieve by interacting and cooperating with fellow humans, obeying the common law, not daring to go beyond the limits sanctioned by society in whatever he does. Society in turn protects and helps him to realise his possibilities, to build his eka. Man is not only a social animal, he is the working animal; he is not so much homo sapiens as he is homo faber. The purpose of labour is to build the eka, the purpose of marriage is to consolidate that eka by supplying it with offsprings who will both protect and perpetuate the eka and, through the eka, the clan and ultimately the species. Hence the need for interaction and exchange, both human and material, between different eka, different clans. And this is where lies the central problem of this story, for Myombekere and Bugonoka fail to get children. Without children, what basis is there for him and Bugonoka to remain united in marriage? Can love alone sustain marriage in a society where offsprings come before everything else, where barrenness is a social stigma? More seriously, can Myombekere and Bugonoka build their eka without offsprings? How, and what for? Can life have any meaning without children? A modern reader, living in a highly competitive urbanised society, schooled in the best traditions of family planning, may see these issues differently. Indeed, he might consider barrenness a non-tragedy, if not a blessing in disguise. But not so the Kerebe peasant society in this novel, for whom abundance of manpower is the precondition for material abundance, security of life and, indeed, survival itself. Hence, Myombekere must get back his wife and, what’s more, get her to conceive and bear living children. Detailed descriptions of his endeavours to this end take up the best part of Volume 1. They include successive trips to his in-laws to retrieve his wife, his efforts to get the fine (which includes six pots of banana beer) to pay for her return, his perennial search for a muganga who can cure his and his wife’s barrenness and finally, the treatment itself and how his struggles are eventually crowned with some success. Volume 2 begins with the birth of Myombekere’s son, Ntulanalwo. He survives, but at great cost to his parents, for he is constantly in need of medicaments, protective charms, close care and attention. As one misfortune after another assails him, we are reminded that (Obunaku) bugonoka – misfortune comes unexpectedly, without warning. It has befallen the family through Bugonoka’s failure to have children. Now, misfortune’s twin brother, death, seems to be bent on wiping out the family. The reader cannot but feel, like Myombekere, that (Olufu) ntulanalwo (I always live with death). It is only after he is transferred to his maternal grandfather’s that Ntulanalwo begins to enjoy some health. While wondering whether their sorrow and suffering will ever come to an end, Myombekere and Bugonoka are blessed with another child, this time a daughter. In sceptical optimism, they name her Bulihwali (when will sorrow end in this world?) hoping that their sorrow would now cease. Life for them now begins to have some meaning. The rest of Volume 2 is really the story of Ntulanalwo and Bulihwali – how they grew up, married, had numerous offsprings and, after the death of their parents, became quite prosperous. The story ends with their death. The story is of course much richer than the above skeleton may lead one to believe. It is not only confined to the lives of Myombekere and Bugonoka and their children, but deals rather with the life of the Kerebe society of the time, seen through the life, actions, problems and aspirations of the family of Myombekere. Myombekere represents Kerebe manhood just as Bugonoka represents Kerebe womanhood. Their quest is the perennial quest of their society; for they are expressing and enacting the dominant values of that society. As their lives unfold before us, we are gradually introduced to a tapestry of the Kerebe world – the culture, customs, beliefs, practices, human relations, productive activities; the geographical environment, the flora and fauna, the months and the seasons; the sciences, the oral literature, the arts and crafts. The story takes place against a background of the rich flora and fauna that is the feature of the island of Ukerewe. This land, situated in Lake Victoria some few miles from Mwanza, is a beautiful, evergreen island, very fertile, heavily populated and potentially very wealthy. Its forests and grasslands had, until early this century, plenty of useful trees and wild animals, which were hunted for their meat and fur. The trees were felled for house building and boat construction (Ntulanalwo is in fact a great hunter and carver of canoes). Along the extensive coastline fishing is a regular preoccupation of some men, so is the hunting of hippopotamuses. Indeed the life and culture of the Bakerebe as depicted in this book is to a large extent based on fishing and agriculture. The lake is the second shamba to the Bakerebe, its products supplement their agricultural diet. Its waters form a natural highway in addition to serving most domestic needs. No wonder the lake looms large in this novel, and numerous types of fish are mentioned and their properties minutely described. Beyond the coastline agriculture is predominant. All typical tropical crops – cassava, millet, bananas, beans, sweet potatoes, etc. grow effortlessly. The wealthier families have in addition some cattle from which they get milk, meat and manure. Cultivating is sometimes done individually and sometimes collectively (obuyobe). There is enough land for everybody and apparently everybody except the omukama (king) and the aristocrats works, or is expected to work. This is precolonial Kerebe land and society as it was and is depicted in Bwana Myombekere na Bibi Bugonoka. It is an apparently healthy, peaceful, hard working society. True, it is superstitious and technologically not much developed, but it is far from being savage or primitive – as many anthropological works on pre-colonial Africa have led us to believe. While not defending its shortcomings, Kitereza, like Achebe (in Things Fall Apart) reasserts the values and achievements of his people. This novel is, in short, a mine of ethnographical, historical and scientific information about precolonial Bukerebe and its people. Yet it is not history, nor is it strictly speaking a historical novel. All the characters are imaginary, all the incidents fictitious. There is no mention of the reigning kings, or appraisal of their historically known actions. There is very little about the political feuds and upheavals that characterised the Kerebe Kingdom in the 18th. and 19th. centuries. All this is beyond Kitereza’s intentions. His primary objective is to preserve the language, customs, practices and cultural traditions of the Bakerebe, seen from the point of view of the ordinary eighteenth century Kerebe, for the benefit of future generations. Bwana Myombekere na Bugonoka na Ntulanalwo na Bulihwali is primarily and deliberately a cultural novel. It is not autobiographical, although anyone familiar with Kitereza’s own life cannot fail to see parallels between his personal problems and those of his protagonist, Myombekere. Like Myombekere, he lost all his children in childhood, yet, unlike Myombekere, he never tried to look for another wife and apparently never went to consult the traditional waganga. Kitereza, born at the crossroads between the past era and the present (colonial) era, is satisfied with merely serving as a bridge between the two eras, revealing the past to the youth of today, without much praise or censure, while personally remaining staunchly modern and progressive in outlook and in practice. This novel is a great work indeed, not only because of its wealth of cultural information, but because Kitereza has put his whole personality, linguistic and artistic talent, knowledge, experience and meticulous care into its execution. This is much more obvious in the original unpublished Kerebe version. In the present Swahili translation something of the original is inevitably lost. One hopes that the Kerebe original will also one day find a publisher. In the meantime, this work remains a classic of Swahili literature. It is the longest Swahili novel ever published, the most racy and the richest culturally. Without question it establishes Kitereza as a leading Swahili – nay, African novelist and the first and last one of his kind. For as there was only one Homer, one Shakespeare and one Tutuola, there can be only one Kitereza. Kitereza represents his age and generation and these two can never come back. Bwana Myombekere na Bibi Bugonoka is not only Kitereza’s masterpiece, it is his eka. His eka is his book, in which he placed his whole talent and aspirations. It is his only child, his only wealth (at the time of his death he was living a very poor man in a single room hut built for him by the Kangunguli Ujamaa villagers). His greatest desire, as he admitted to the present author, was to see his book in print before his death. How tragic that even this small wish never materialised, for he died while the advance copies of his novel were awaiting collection at the post office in Dar es Salaam. Kitereza, A., “How Men and Women came to Live Together” (Edited and introduced by Charlotte and Gerald Hartwig): Natural History LXXIX (1970) pp.9-20. Hartwig, G.W. and Charlotte M., “Aniceti Kitereza: a Kerebe Novelist”: Research in African Literature, Vol.3, No.3, (1972) pp.162-170. J. Roger Carter, “Aniceti Kitereza- the Story of a Tanzanian Writer”: Bulletin of Tanzanian Affairs, No.14, January 1982. At the quinquennial meeting of the National Conference of the Party held in October, 1982, President Julius Nyerere was reelected Chairman for a further five years by 1,726 votes to 9; Vice-President Aboud Jumbe was reelected Vice-Chairman by 1,716 votes to 19. In the election by the members of the National Conference for the 130 elective seats on the National Executive Committee of the Party (the remaining 63 members are ex officio), Hon. Kighoma A. Malima, the Minister for Planning and Economic Affairs was defeated. The new Secretary General of the Party, chosen by the National Executive Committee from among its own members, is Rashidi Kawawa, one time Second Vice-President of Tanzania and later Prime Minister and Second Vice-President and later still (from 1980) Minister without portfolio. There have been reports of drought and the consequent threat of food shortage in Mwanza and Arusha Regions and of new wells running dry in Masasi District. The United States of America is providing 26,000 tons of maize and rice as part of its food aid programme. In 1980-81 the weight of coffee sold was at an all-time high at 67,340 tonnes, 21% higher than in the previous record year, 1975-76. As a result of the slide in coffee prices, however, earnings from coffee in 1980-81 were 26% less than in 1976 -77, the record year for earnings. The high yield in 1980-81 was officially attributed to good climatic conditions in most coffee growing areas, and increase of area under coffee and the effects of the Coffee Improvement Programme supported by the European Community. It is unlikely that climatic and other conditions will favour the coffee harvest this year and there have been reports of widespread infection by coffee berry disease, said to affect 80% of trees in the areas growing mild Arabica coffee, which accounted for nearly 80% of the 1980-81 crop. The area around Mount Kilimanjaro is said to be badly affected. The Government, however, have reserved 10% of coffee export earnings for the purchase of pesticides and other requirements for improving the crop. Grants made in support of agriculture include shs.56 million from Japan for the purchase of Japanese fertiliser and other agricultural chemicals and shs.14 million from Norway for the University of Dar es Salaam Faculty of Agriculture. An agreement has been signed to establish a railway linking Uganda, Rwanda and Burundi with the Tanzania Central Line at Uvinza. Contracts for the survey and design of the 2,000 km. network have been awarded by the Kagera River Basin Organisation (an intergovernmental body) to the Italian consultants Technictal in association with Austrian Railways Engineering. The existing railway system is being repaired and improved with assistance from Austria, Denmark (signalling equipment) and the Canadian International Development Agency (CIDA) (modern communications system for the Central Line). The building of a heavy engineering workshop in Morogoro for the repair of diesel engines was completed in October, 1981, and the building of workshops in Tabora and Moshi is proceeding. The Tazara line to Zambia is running far below its planned capacity. A main cause of the problem has been the repeated breakdowns of locomotives. Measures to improve the performance of the line include the replacement of some of the existing Chinese locomotives with new ones from West Germany. A new state-owned shipping line has been established – the Tanzania Ocean Shipping Company – with one ship, m.v.Jitegemee. Canada is to provide a grant of shs.215 million for further oil exploration. Arrangements have been agreed with China to start production of coal from the Kiwira coalfield. The output will be used to power the Mbeya cement works and the Mufindi pulp and paper factory (financed by Kuwait). Bulgaria is to make a credit available for the purchase of equipment for the Mbeya brick and tile factory. Trucks and Waggons are being supplied by Finland to move phosphates from Minjingu near Arusha to the Tanga fertiliser factory. The African Development Bank is making a 50 year loan for the electrification of the towns of Newala, Masasi and Nachingwea. Denmark is providing spares for cement factories and for the Kilombero sugar factory. Two members of the Kenyan airforce who fled to Tanzania during the recent troubles in Kenya in August, 1982, were not extradited, as requested by Kenya. They have been granted political asylum, but Tanzania has indicated that it wishes them to be accepted by a third country. The hijackers of a Tanzanian aircraft, which eventually landed at Stansted airport (see Bulletin No.15 of July, 1982) were convicted. The leader was sentenced to eight years in prison and the others to terms of between three and six years.